…. it’s the bus syndrome again. Nothing for weeks. And now…. Get ready for a stream of posts from this old dog. With so much to write about…. And so little time. Because hasn’t it been wonderful? The summer I mean. After an endless run of damp dark years, when it felt like July and August had gone off to somewhere else in the world and forgotten about us, we’ve been rewarded for our patience with a summer from the days when we were young. Where we can throw open windows and doors…. Put up the sun umbrellas and lay out the cushions in the garden…. Drag the cover off the barbecue and light it…. and then do it again a couple of days later. Sit outside in the gathering dusk, eating and talking and remembering old times…. without having to go inside because it’s really far too cold or about to rain or the wasps have taken over. And while this glorious weather has been doing it’s thing, I’ve been doing a few new things of my own. A couple of weeks back I went to the Proms for the first time. Picture the scene. It’s a Tuesday afternoon. I’m on a bus from Victoria station. The backs of my legs are sticking to the seat, the hair on my neck is hanging in damp curls. I’m so hot I feel like I’m going to dissolve, so that when the bus stops outside the Albert Hall it will be a puddle of water that slides out of the door onto the pavement. But I make it intact and step out into a swarming mass of excited Wagnerites. Because this is what I’m in letting myself in for. A night of Daniel Barenboim conducting Die Walkurie, the second part of Wagner’s Ring Cycle. Am you completely mad, I hear you cry. Die Walkurie goes on for five and a half hours…. You missed the first part so you won’t have a clue what’s going on….. There are no costumes or props or anything to keep you amused if the music doesn’t…. And no subtitles…. Just singers and an orchestra and not a lot else. And to make matters worse it’s eighty-five degrees in the shade…. And The Albert Hall doesn’t have air conditioning. But this is how the BBC described the evening. Sounds kind of exciting, don’t you think! And it was. Exciting and amazing and fantastic. Honestly…. So if I’m going to be introduced to Wagner and The Ring Cycle it’s the right way to do it…..
And then two nights later I went to The Globe for the first time. Another beautiful night. So perfect for a theatre with a roof that opens to the sky. 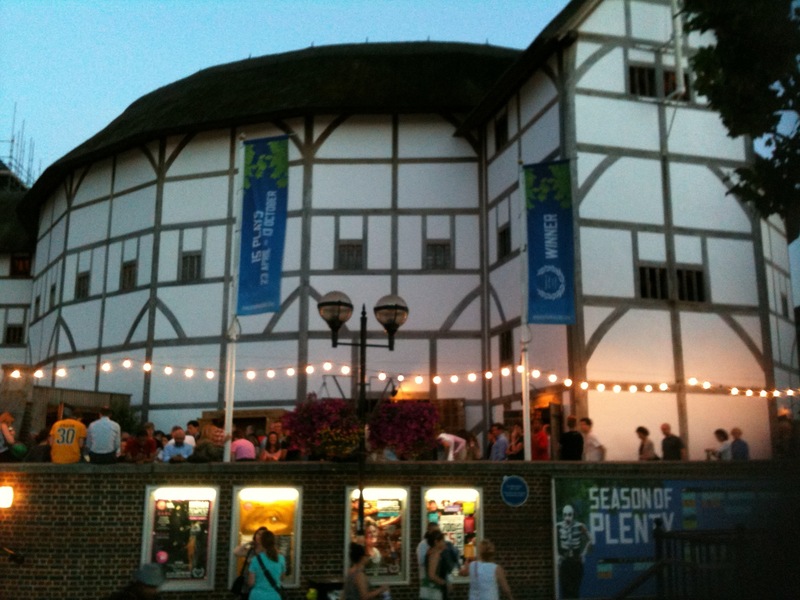 And I’m there to see A Midsummer Night’s Dream with my daughter Hattie, who has bought the tickets as a mother’s day present. So dinner together in Borough Market. 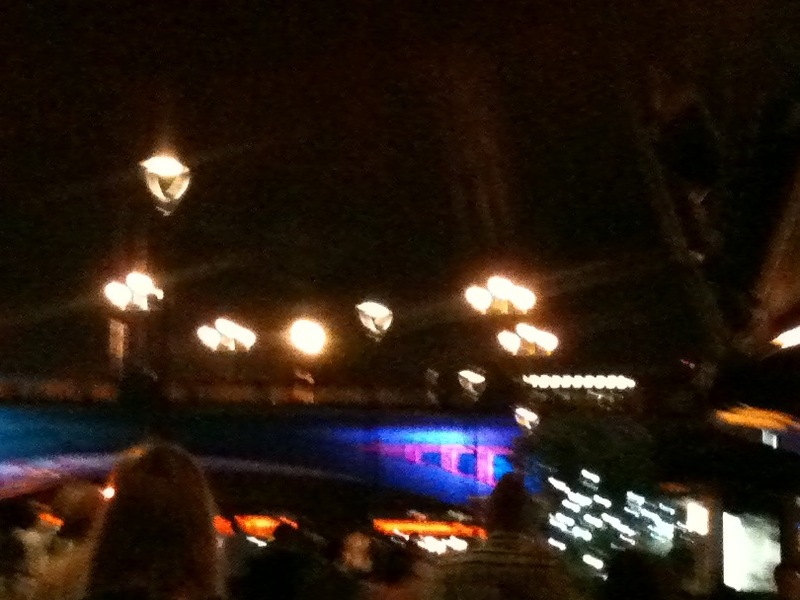 Then we wandered along the side of the Thames through the evening crowds. 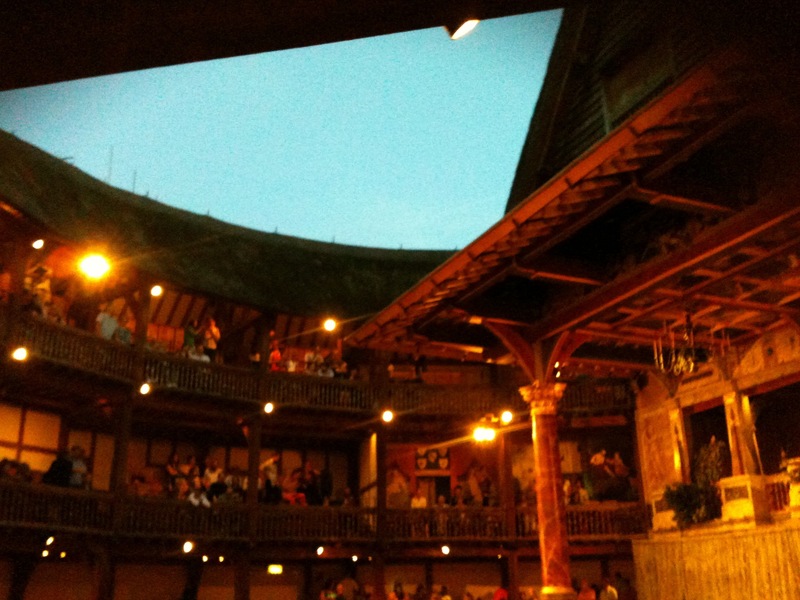 The Globe is lit up and enticing, like a birthday cake. Inside the atmosphere is buzzing. We’ve rented cushions (thank goodness…. the seats are wooden benches) and we settle ourselves down with the rest of the audience and prepare to be dazzled and amazed. Which we are…. It’s fast and furious and laugh-out loud funny. Fairies, muddled lovers getting lost in the woods, Bottom and Puck and Titania; Shakespeare at his most relaxed and devious. 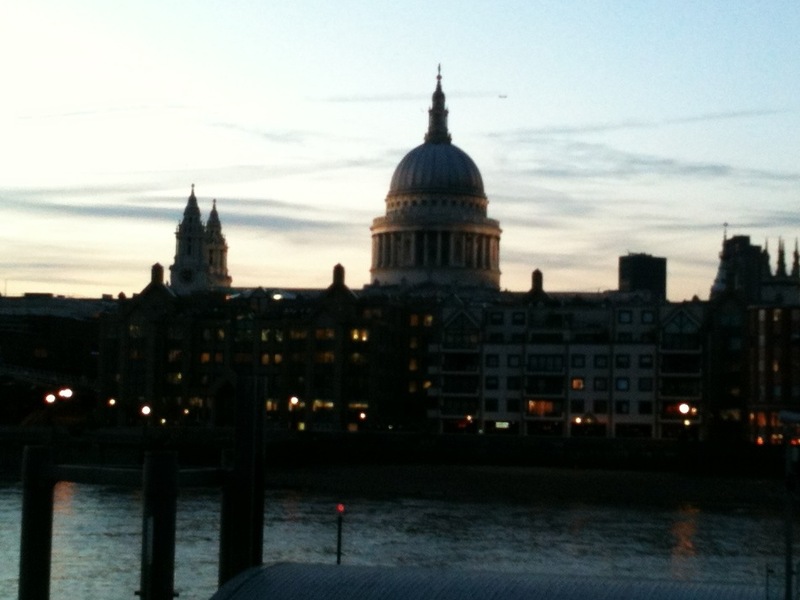 At the interval we sit on the wall by the Thames as the light fades. And when it’s over we walk back along the river towards London Bridge station. With the moon competing with the street lights to see who can outshine who. Not a great photo but spot the moon in the middle…. You’ve got to love summer nights….